New geologic evidence of past periods of oscillating, abrupt warming, and cooling | Watts Up With That? Figure 1. 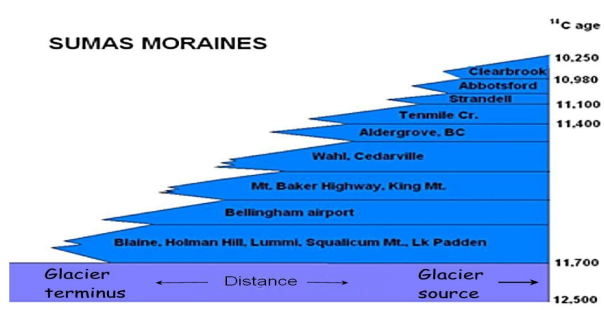 Successive terminal moraines from short–term glacier recessions caused by climatic warming between 11,700 and 10,250 years ago. Figure 2. Paleotemperatures derived from oxygen isotope measurements of the GISP2 Greenland ice core. Red peaks are times of warming and blue are times of cooling. The average time period for each climatic oscillation is 27 years. Figure 3. Coincidence of Pacific Decadal Oscillation (PDO), global temperature, and glacier fluctuations in the North Cascades. 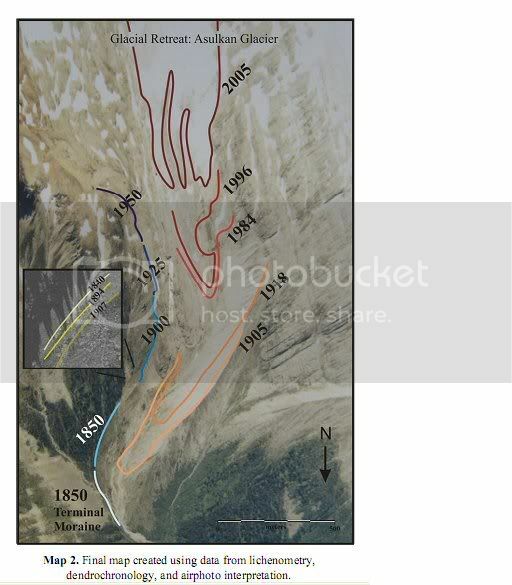 Glaciers advanced during the 1880–1915 cool period when the PDO was cool, then when the PDO switched to its warm mode, global temperatures warmed, and glaciers retreated from ~1915–1945. The PDO changed from warm to cool ~1945–1977, global temperatures cooled and glaciers advanced once again. In 1977, the PDO switched from cool to warm mode, global temperatures warmed, and glaciers retreated. In 1999, the PDO changed back to its cool mode and global cooling began. Figure 4. Projection of climate changes of the last century and past 500 years into the future. The black curve is temperature variation from 1900 to 2009; the red line is the IPCC projected warming from the IPCC website in 2000; the blue curves are several possible projections of climate change to 2040+ based on past global cooling periods (1945-1977; 1880 to 1915; and 1790 to 1820). 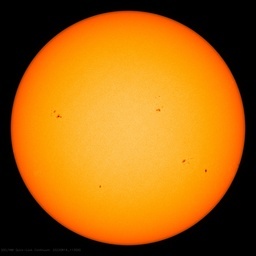 The lack of sun spots during the past solar cycle has surpassed all records since the Dalton Minimum and some solar physicists have suggested we may be headed for a Dalton or Maunder type mimimum with severe cooling. November 10, 2009 in Paleoclimatology. This shows that it’s not a good idea to settle on the early predictions of a young climate science as Al Gore has done. For if you think the science is settled you’re more often wrong. What is it with the notion of “settled science” anyhow? What a bizarre anti-scientific notion “settled science” is. This is a really interesting paper. so is there a link between PDO cycles and solar cycles or just coincidental? VERY fascinating study. Another nail in the ole’ coffin. However, I was eager to retrieve the expanded abstract and slides link, but could not make it work. Frank (19:29:30) : Not only smoking,the barrel is split in two and there are flash burns all over warmists faces on this one. 8250 BC is essentially yesterday. Our hubris about the ice will do us in. It could come back so fast. Apparently the slides and expanded abstract aren’t posted yet–they should be up soon. Thanks for the post Don! The actual physical geological evidence and the reconstruction of the dates and sequences tell us a lot about what happened and when it happened. 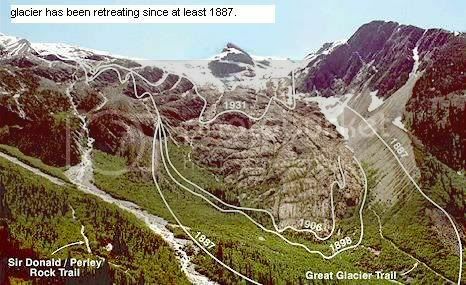 Pretty hard to fake a glacier. The correlation with the PDO could be causation or it could indicate a common independent cause. Ditto the solar issue. The only thing that matters for the current debate is that glaciers advance when the PDO goes cool. 2. 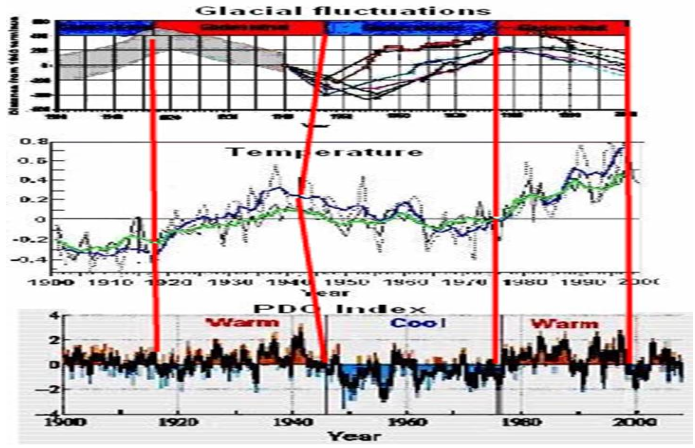 In Figure 3, why does the big thick red line 2nd from the left connect 1950 at the top to 1940 in the middle to 1950 at the bottom? What’s that supposed to show? 3. Why does Figure 4 use 10 year old projected warming from the IPCC? Since then, AR4 has been published (in 2007). Why not use the projections from that? Not that I’m an alarmist or anything and maybe I’m being stupid but …. 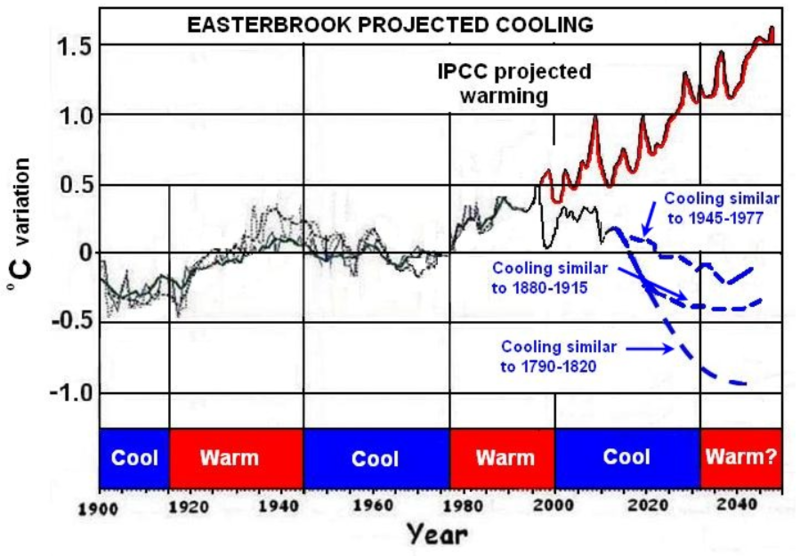 If Easterbrook is correct as he well may be this will certainly put paid to the AGW religion. I find such a victory for sanity cold comfort as an increased temperature would improve our lot. A colder world is not a thing to be looked forward to. Historic climatic and oceanic temperature fluctuations are associated with solar variations. Abrupt changes are what we learned about when Mt. St. Helens blew, and deposited in days what we thought took something like 1,000 yrs. Fits with the literary past, too. And today, the report on Fox News of 2 early snows in Beijing. The sooner we get the Goredown Man Hoax fully outed, the sooner we can get on to preparations for what lies ahead. Looks like 2015 is key. A colder world is to be feared if the Agenda suceeds in moving the world the wrong way on the freeway. It need not be if we can prepare to adapt to a cooling world. I find no evidence of this in the post or in the records. There’s talk about it in the post but nothing to confirm it. Also, there is no evidence of a correlation between Solar Cycles and ENSO, if you’re wondering. A nice simple message from this piece – historically the earth warms and cools over a 30 year(ish) period and extra atmospheric CO2 is not to blame. I also think our chaotic climate is fractal regarding change over time, and we get cooling/warming to different degrees on all time scales. Makes life interesting. The PDO drivers need to be identified, it is obvious the PDO and ENSO are major long and short term influences on Earth’s climate. The Solar link to PDO falls down dramatically between 1940-1960, the PDO is negative and the world temps are declining but the highest sunspot activity in 400 years is recorded. The only legout I can see is nuclear testing, but I am unsure of their climate impact. Perhaps Dr. Scafetta is on to something? Hey! This paper deals with my neck of the woods! We’re famous!!! Gonna git me a reality show! Woohoo! Seriously, very interesting paper Dr. Easterbrook. Thank you. The more we can understand about the paleoclimate, the more will be our understanding of today’s climate. The pro-AGW climate scientists can’t see variability in the historical record. They (almost) accept that there were indeed ice ages but everything seems to be explainable through greenhouse forcing to them. CO2 hardly changed at all from 9,000 BC to 1750 AD, yet there is considerable variability in the climate over the period. CO2 fell to 280 ppm (for perhaps the very first time in Earth history) 24 million years ago and has stayed at or lower than that level ever since (give or take some ups and downs in the ice ages and the recent increase we have added.) Yet the climate has varied by +/- 4.0C to 5.0C over that period. You mean there was a climate before 1978 and it changed naturally? Really? Does anybody else know? I don’t want Landscheidt and barycentric discussions here. You are free to discuss this topic anywhere else, but don’t do it on WUWT. Owners prerogative. All future comments on this topic will be deleted. Very interesting piece, Don. Geology strikes again. A key element is the information to project a possible range of temperature declines. Noting which, in Figure 2, the 1880-1915 cool period is especially cold. Can that be the added effect of Krakatoa? 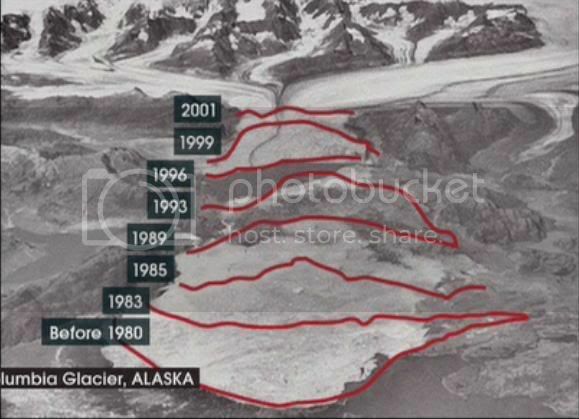 On another entry with reference to current shrinking of glaciers there are many posts claiming this does not represent temperaturte mearly precipitation changes. Which is it to be? Sceen shot from Gores fairy tail. Screen shot from Gores fairytail. But the UAH lower troposphere global temperature record shows a .11 deg C/decade warming trend since January 1999. How does this square with the quoted statement? January 2007, with it’s very warm reading of a .594 anomaly, was far warmer than any temperature recorded in 1999: that is some global cooling! From that point there was a cooling reaching a minimum in May 2008, coinciding with La Nina and the solar minimum. Since that time temperatures have trended up strongly, with September 2009 recorded as the warmest September in the satellite temperature record, and this occurred more than two years into the longest and deepest solar minimum in 100 years. Methinks that a 1 and a half year warming trend from the last low with a record high September temperature is hardly ‘intensifying’ cooling. Yes – this bothered me somewhat. If we’re now a full decade into the current cool PDO phase then I’m not sure global temperatures are responding in the way we would expect. I accept that one cool phase might be different to another, but it only took about 6 years for most of the cooling in the 1945-77 phase to be realised. I’m also a bit puzzled by Don’s Fig 4. He says “The black curve is temperature variation from 1900 to 2009” , but the curve suggests post-2000 temperatures have been consistently below (or certainly no higher) those in the 1990s . Whichever dataset is used, we know this is not the case. I am old enough to remember working through the coldest NW Europe winter for 250 yrs in 62/3. A open atmosphere test ban treaty was signed I think in 61 to end all atmospheric test by the end of 62. In consequence, there was an enormous amount of testing that went on in 62 that may/could have contributed to that winter. Compare Lucia’s +/- 95% statistical trend lines of Hadley temperatures compared to IPCC projections. Note the IPCC nominal trend of 0.2C/decades (purple) lies well outside and above those uncertainty intervals. This means that if 2001 is a “fair” year to begin comparisons between models and projections, then the nominal projection in the IPCC AR4 is inconsistent with the earth’s trend which it was intended to project. Dr. Easterbrook presents some useful insights into the recent past, but why stop in the Pleistocene? The glacial deposits he describes overlie Eocene rocks that preserve fossils of sub-tropical floras that flourished in the Pacific Northwest. Of course some have argued these Eocene strata were emplaced from Baja, but that is another discussion.